Material Options- A unique advantage of lathe cut gaskets is that they can be made from any polymer group. Lathe cut gaskets are a favorable alternative to o-rings, gaskets, and washers in many applications. 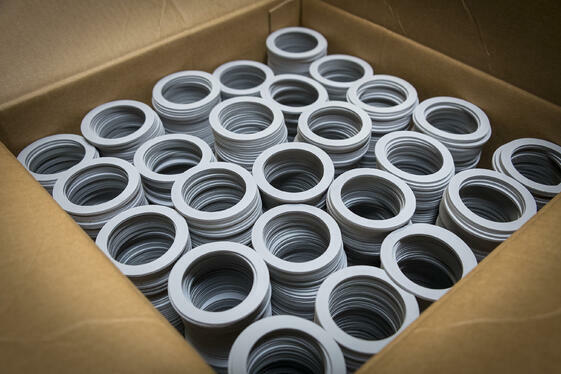 Whether your customer requires lathe cut gaskets for oil and gas applications, outdoor applications, dynamic applications, or even food grade applications, Grand River Rubber can provide high performing gaskets for a multitude of applications. Read How to Choose Lathe Cut Gasket Materials for Various Applications for a breakdown of which materials are best for certain applications. Better Seal Longevity- Lathe cut gaskets have a rectangular or square cross section, which offers a larger sealing surface compared to that of an o-ring or other molded gaskets. A lathe cut gasket with a wider sealing surface can also provide better resistance and longer-lasting performance over an O-Ring. Lathe cut gaskets are also more advantageous in static applications. For example, if you were to get an O-Ring and a lathe cut gasket next to each other and apply equal pressure to both, over time you will notice the lathe cut gasket surface will relatively remain the same while the O-Ring would be flattened. Over time, the O-Ring begins to lose its shape and size, due to the amount of pressure it receives, flattening out its sealing surface. Read: Lathe cut gaskets vs. o-rings—One in the same or wildly different? Cost Savings- Lathe cut gaskets provide customers with significant cost savings, in comparison to molded or die cut gaskets. Lathe cut gaskets can be made out of any polymer group and offer distinct cost savings for custom sizes, since there is little to no tooling required in the lathe cut process. Whether you need the gasket itself to be a little thicker or you need the sealing surface to be a bit wider, both are quick and easy fixes. Grand River Rubber & Plastics can extrude sizes from .250” to 7.75”, whereas O-Ring and gasket manufacturers using a molded process, only typically have molds for standard sizes, such as .500” to 3.00” ID. When a larger ID is required, they most likely would have to develop a mold, which can be very costly. Read: The Top 5 Reasons to Choose Lathe Cut Gaskets for Your Next Application for more information. Gas caps—small lawn equipment, lawn motors, weed eaters. Sprayer gaskets – lawn maintenance hand held sprayers, deck stain machines, and sprayers for other industrial uses. Gas meters- Risers going into gas meters. Lathe cut gaskets are versatile and can be used in a multitude of industries and applications. At Grand River rubber, our goal is to consistently exceed our customers’ expectations. We value our re-sellers and strive to educate them on our processes and products. For more information regarding lathe cut gaskets, please contact us below.